Through my research of John James Stanaway , his children and grand-children, I come across descendants of the highest pedigree. The latest is the great-grandson of John James Stanaway, through his daughter Phoebe Maria Rowlands (nee Stanaway). The following was published by Rowing New Zealand, 19 March 2015. 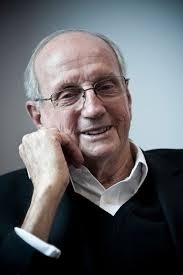 It is with great sorrow that Rowing New Zealand report that Sir Don Rowlands has passed away aged 88. Rowlands is a huge loss for the rowing community and sadness will be felt throughout New Zealand and across the world. It has been a real privilege for New Zealand rowing that Sir Don Rowlands was such an active member of the rowing community and he has achieved some extraordinary things throughout his lifetime not only in the sport as a rower and an administrator but also as a businessman. Donald David Rowlands was born on 17 June 1926 and grew up in Owhango as one of five children born to Ruby and Horace Rowlands. His father Horace ran the local sawmill for the Dominion Timber Company and would teach him many lessons around quality, hard work and managing people. Rowlands rowed at the highest level, he was a Rowing New Zealand selector and vice patron, he showed a breadth of vision that transformed the sport of rowing in New Zealand. He was a great leader of the sport and had a talent for managing people, he was an excellent communicator and listener. In the 2015 New Year’s Honours list Rowlands was acknowledged and he became a knight of the New Zealand Order of Merit for his services to rowing and business. Governor-General, Sir Jerry Mateparae conducted a private investiture for Sir Don Rowlands on 9 March 2015 in Auckland Hospital. In 1973 he received his first honour when he was appointed a Member of the Order of the British Empire for services to rowing; he was promoted to Commander of the Order of the British Empire in 1979. In 2015 Rowlands was appointed an honorary Member of the Order of Australia for significant service to the sport of rowing in the Australia Day Honours. Rowlands had an outstanding rowing career which saw him win nine New Zealand rowing titles between 1949 and 1957. In 1949 he was part of the West End Rowing Club crew that won the clubs first red-coat (Premier title) with victory in the Premier Eight on Lake Karapiro. He won a total of three premier titles in the men’s eights for West End, in the double sculls he also won in 1957 in St George’s colours. He was a top single sculler winning the New Zealand premier title in succession from 1953 through to 1957. In 1957 he won under St George’s colours, but the previous four occasions for West End. He was also an Australian National Champion. In 1972 he coached a West End double which won a premier title. The West End eight crew of Donald Rowlands, Donald Adam, Kerry Ashby, Murray Ashby, Bruce Culpan, Thomas Engel, Grahame Jarratt, Edwin Smith and Bill Tinnock were selected as the New Zealand eight for the 1950 Empire Games where they finished a close second, only a foot behind the Gold Medallists, Australia. Sir Don Rowlands won a total of two medals as a New Zealand representative rower at the British Empire Games in 1950 and 1954. In Vancouver in 1954 he raced in the single scull to win gold. He was the chairman for the organising committee of the World Rowing Championships at Lake Karapiro in 1978, when the World Rowing Championships returned to New Zealand in 2010 he was the Patron of the event. The role in the lead up to the 1978 World Championships involved 18 months of weekends at Lake Karapiro with an army of volunteers that built facilities which were in use until 2010, when the facilities were upgraded for the 2010 World Championships. Sir Rowlands has played an integral role in rowing at Lake Karapiro and has been a leader in the maintenance, development and event management of world-class rowing events through Karapiro Rowing. The rowing course and facilities at Lake Karapiro will be his legacy for generations. From 1960 to 1977, he was a New Zealand rowing selector. He selected a number of crews which went onto win Olympic gold including the Men’s Coxed Four at the 1968 Mexico Olympic Games and the Men’s Eight in 1972 at Munich. He managed the 1962 New Zealand Commonwealth Games rowing team and the 1997 World Championships team. Don continued his involvement in the sport until his passing. Rowlands was the Vice-Patron of Rowing New Zealand (New Zealand Rowing Association) and a Life Member. Rowlands has also served for the World Rowing governing body FISA, from 1974 to 1992 where he represented New Zealand and Australia. His involvement saw him building rowing courses all around the world including the Olympic courses in both Los Angeles and Sydney. He was the FISA Continental Representative in Oceania from 1974 to 1992, a member of the Events Commission, and an Honorary Member of Council. He was also a former Vice President of the New Zealand Olympic Committee. He was awarded The Olympic Order Medal in 1982 and FISA Distinguished Service Medal in 2009. Rowlands has also won two Halberg Awards for leadership and service to sport. Don and Coralie Rowlands with Prime Minister John Key. 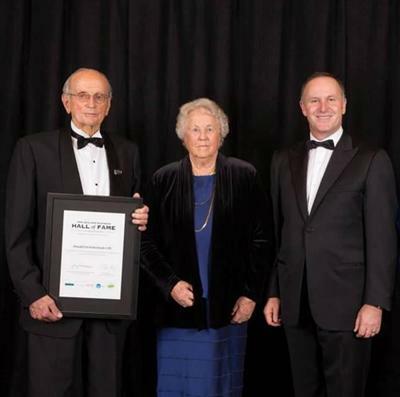 Rowing New Zealand would like to acknowledge that Rowlands was inducted into the New Zealand Business Hall of Fame in 2014. His dedication to business has been far-reaching; his journey began with an engineering apprenticeship at McEwans in Auckland. 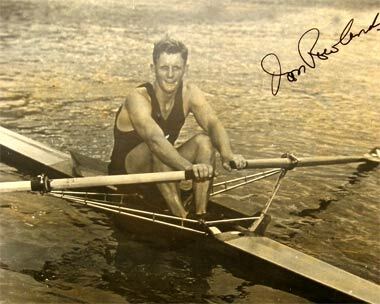 He also worked at Mason Brothers Engineering where he began his rowing career as part of a business house competition. He also worked in Thames at Charles Judd Ltd, before he embarked on a 48 year career at Fisher & Paykel. He held roles including chief executive and director of Fisher & Paykel Industries from 1978 to 2001. He was also the chairman and then director of Mainfreight. He was a director at Hamilton Jet, Progressive Enterprises, Nestle, Henderson Pollard and Champion. He has had many roles such as President of the Auckland and New Zealand Manufacturers Federation; he also sat on the Sports Foundation, Rotary and The Business Round Table. 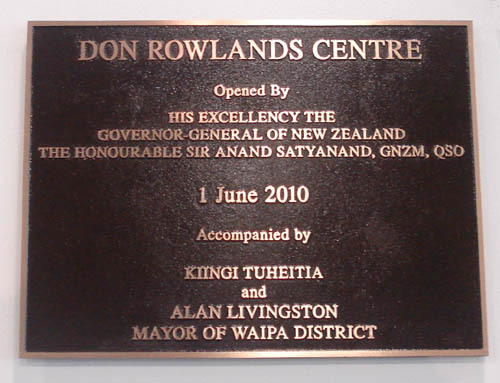 The Don Rowlands Centre Plaque. Rowing New Zealand sends its love and best wishes to his wife Lady Coralie, his son David and extended family and the rowing community at this difficult time. Don is a huge loss for the rowing community and he will be sorely missed. This entry was posted in Uncategorized on October 21, 2015 by gregorypaulskinner. As we get corrections or more information on different descendants we are updating their page almost immediately, so please keep sending in information, and if you have not visited your branches page lately you may want to as these get added to regularly. This entry was posted in Uncategorized on October 18, 2015 by gregorypaulskinner.